Equality Illinois seeks to build the policy and political power of LGBTQ Illinoisans by linking qualified lesbian, gay, bisexual, transgender, and queer people to openings on key state boards and commissions. 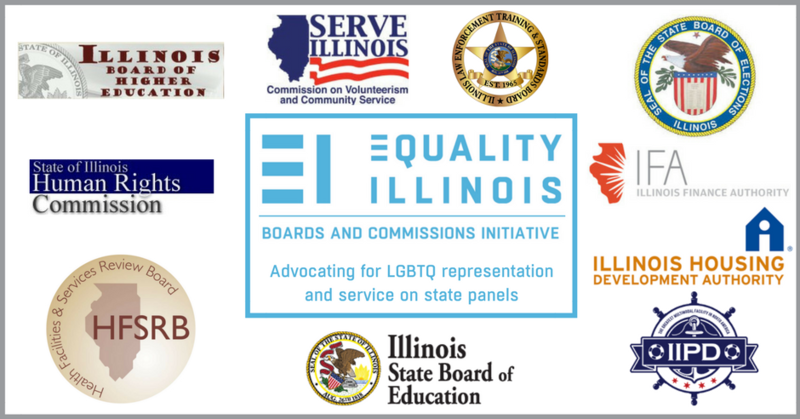 The Boards and Commissions Initiative seeks to enhance the visibility and public leadership of LGBTQ Illinoisans on the important state boards and commissions that are instrumental to the operation of state government and drive major policy decisions. LGBTQ individuals interested in lending their talents to the state through service on a board or commission can submit their information to Equality Illinois. Equality Illinois will focus on appointments to panels that have power over five key areas that intersect with the needs and priorities of LGBTQ communities: civil rights and civic engagement, economic development, education, health and human services, and public safety and criminal justice but will also encourage service on any board of interest to an LGBTQ Illinoisan.